There we go. Sorry Ryan, you won’t weather as well sitting outside all winter. 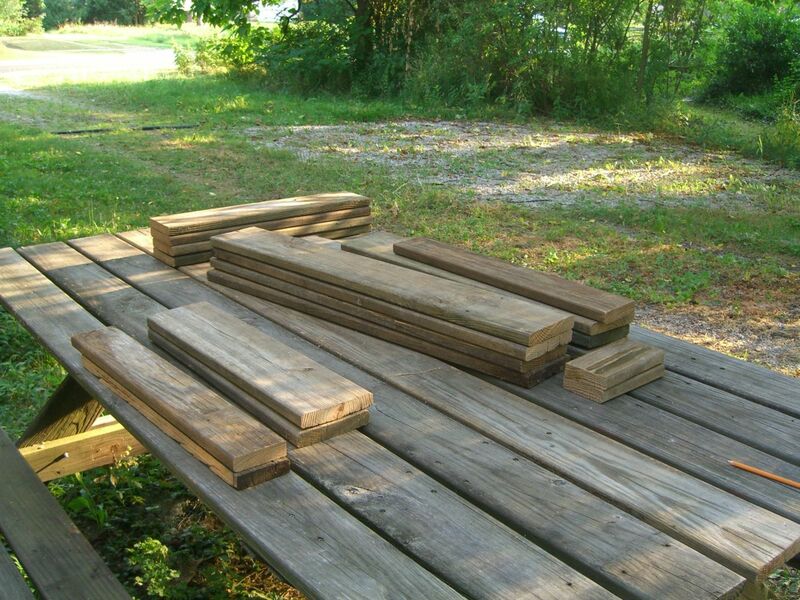 Even after completing that picnic table several years ago I still had maybe a dozen 8-foot lengths of almost 1×6 (I’ll explain the almost later) and a desire to create a sitting space other than my front porch. 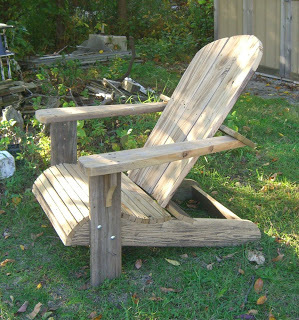 I’ve always liked the look and feel of Adirondack chairs (variants sometimes called Cape Cod-style, or Muskoka apparently) – the wide arms, the curved seat (not always a standard design element, FYI), the high backs, and the rustic quality, plus I used to go to Boy Scout camp in the Adirondack Mountains. So there we are. 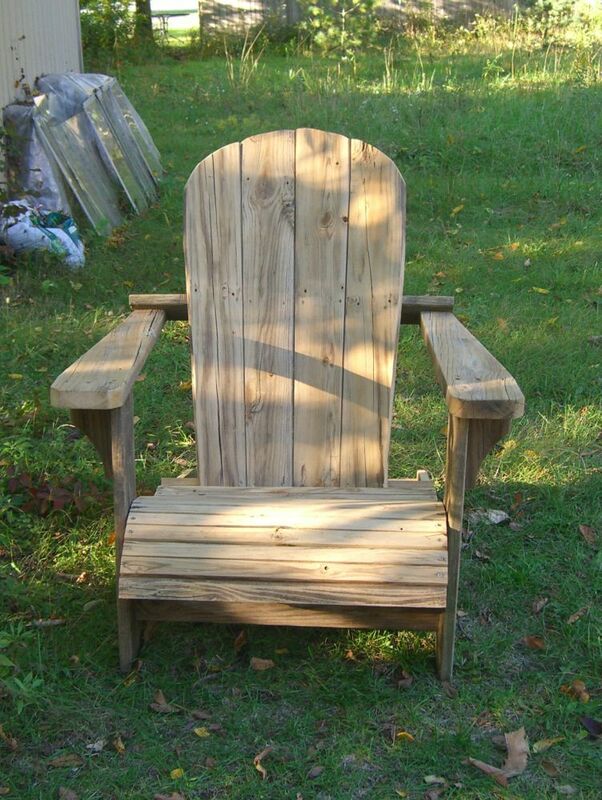 Searching for chair plans online brought up literally dozens of options. I settled on this plan for its look – it really seemed the most comfortable of the designs I viewed – and its largely complete instructions set including three excellent options for creating the cut templates. 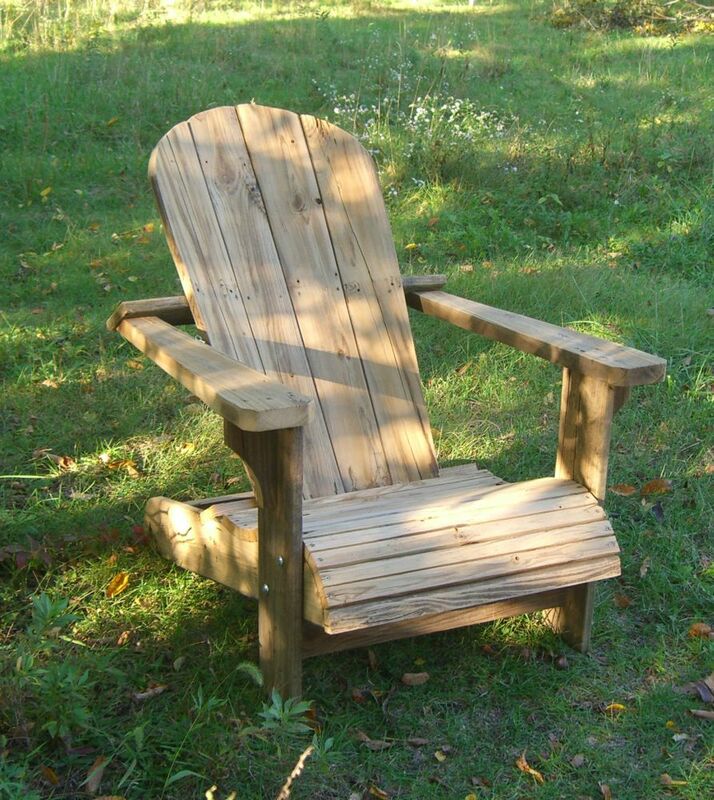 Depending on the wood you buy, 38 feet of 1×6, 8 feet of 1×4, and 68″ of 2×6 could wind up costing $100+ easily. 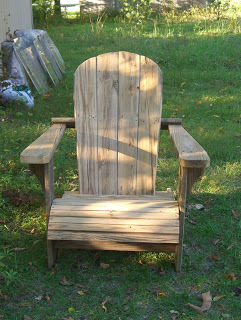 Because these chairs are meant to be used outdoors – and therefore may be painted – this is a great project to use reclaimed or even scrap lumber. It’s even better if you have ‘spare’ pressure treated (or, heaven forbid, redwood or other traditional outdoor furniture woods) boards. $10 in fasteners and several hours of work later and you’ll have a conversation piece from which to have very relaxed conversations. This project got stopped and started several times due to other work, but I’d estimate it as doable by one person in four hours (not counting sanding) IF you have all the tools and space so you don’t get in your own way. Everything except the arms cut to length. I chose to rip the 1x4s out of the 1x6s instead of buying or finding 1×4 pressure treated. 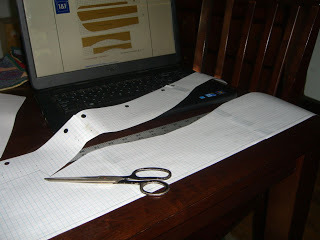 I opted for combining the grid plan and measurements templating options from the site. Pro-tip on making templates for symmetrical cuts (like the back supports) – you only need to draw out half of the template; just flip it over on the board to trace the other half. You also only need to template the top of the back slats. The long angle can be marked with measurements and a straightedge on the board itself. You can also ‘nest’ some of the templates since cuts are only made on one edge of the wood. 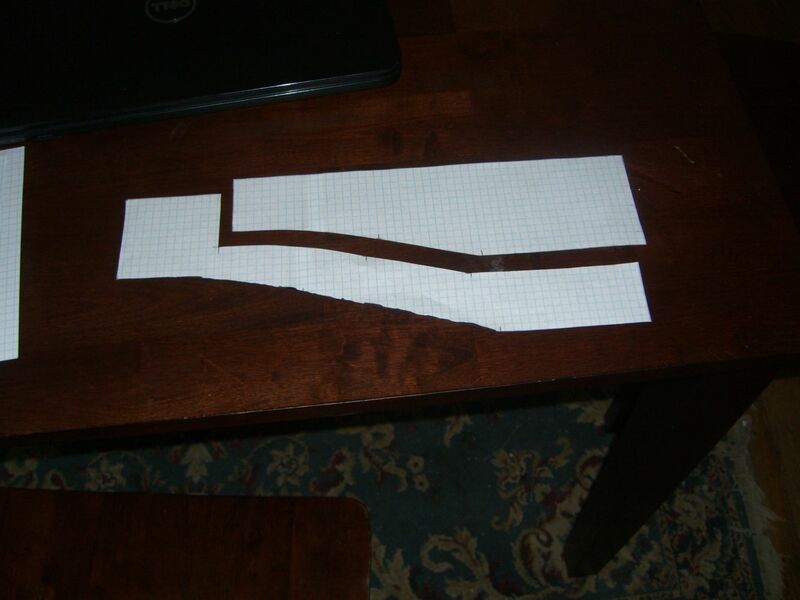 Saves time and paper, but does require a bit of spatial reasoning. Above, the upper and lower back supports. Not much else to report – the online plans (and handy pictures) were easy to follow and made a lot of sense. Two adjustments, and then another pro tip. First, I skipped the part in the instructions where they suggested temporarily attaching the sides to the leg/arm unit and using temporary spacers to keep the right width. I just maneuvered everything into place, clamped, and attached the bolts directly, several steps early. It’s possible I lucked out and got everything pretty square by accident. If anyone sees a good reason to do things the way the instructions say, I’m all ears. 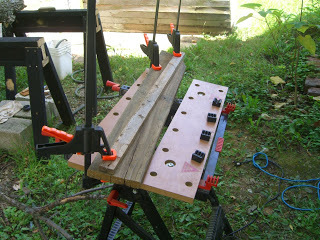 Second adjustment – I was sloppy in measuring the salvaged wood. The boards are actually 1 1/4x6s – so one inch thick instead of 3/4″ thick. This had virtually no impact on the construction, save for the rear spacer which had to be cut down a half inch (1/4″ on either side) to fit. 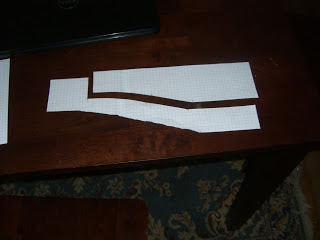 As always, measure twice, cut once, then remeasure, realize your mistake, and cut again. No, I was wrong. That’s my mantra. Narrow scrap wood should be a mainstay of every shop – easiest way I know to guide a circ saw along a long angled cut, like for the back slats. Invest in a good saw blade for said circ saw. If you’re cutting pressure treated wood or heavy hardwoods, get a new blade, period. My old blade was bucking and binding when trying to cut the arms especially. $11 at the hardware store later and the cut took less than three seconds. Finally, if you’re using reclaimed wood, take advantage of the ravages of time. Knots, gouges, nicks – don’t sand them all away. And with weathered pressure-treated wood, experiment with not sanding down too far to allow for multiple colors and graining to emerge. The arms (which I have no idea where that wood came from, just that I had almost the perfect lengths sitting on my shelf) have three or four colors, like desert wood, from yellows to grays (of course) to even a bit of reddish purple. 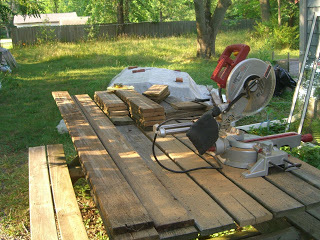 And the sides (second shot below) are tiger-striped because of how deep the worn ridges in those boards were. Great accents to the piece, I think. Filed under backyard, furniture, outside, tools and materials. You can follow any responses to this entry through RSS 2.0. You can leave a response, or trackback from your own site.